Wee Catch Diamond winning the Premier Class race at Marsa, yesterday. The 53rd meeting of the season yesterday was the last one for the year before the Christmas recess. Despite the bad weather, a full programme of nine races, all for trotters and over a mile distance, was held regularly at the racetrack. Certainly the most important race of the evening was the seventh on the card which was reserved for Premier Class trotters. Here, victory went to Wee Catch Diamond, yesterday under the guidance of driver Julian Farrugia. Twelve horses lined up for the Premier race. Wee Catch Diamond made the fastest start to build a small lead from Vejby Boom (Carl Caruana) and Midnight Hall (Mario Fenech). With a lap to go, Wee Catch Diamond was still going strong and the charging German trotter maintained its pace till the finish line to seal a sixth win of the year after managing to hold off the challenge of Vejby Boom in the final straight. Ohime Mag (Ronald Cassar) and Radjah Man (Felix Casha) followed home in that order. The winner clocked an average time of 1.15.3” per kilometre. The remaining eight races on the card were reserved for Gold, Silver, Bronze and Copper category horses. In the opening Gold Class race, early leader Pronger (Claudio Refalo) ran out of steam when the front trotters turned for the straight. 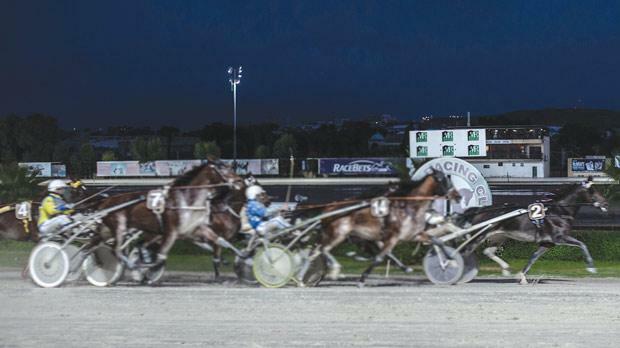 In the final metres, Swedish trotter Pronger was outsmarted by Italian Nashville Dancer (Andrew Farrugia) which secured its first win at the Marsa Racetrack, a half-length’s lead from Helacs Falo (Julian Farrugia). Global Legislation (Clint Vassallo) was fourth behind Pronger. Opal Hall (Tony Mallia) dashed strongly from the inside midway through the final few metres of the second Gold Class race. Mallia’s trotter gained its first win of the season less than a length in front of American Peel And Stick (Eugenio Bondin). Atomic Rapida (Paul Bonello) was third and Zizou Limburgia (Noel Baldacchino) fourth. In the other Gold Class race, favourite The Candyman (Michael Sultana) cruised to its second win in a row after leading all the way. Starfirefinnfemfel (Dylan Gatt), Radjah De Marzy (Patrick Spiteri) and Ramses Des Rouches (Redent Magro) were also involved in the challenge for the top places and followed behind The Candyman in that order.